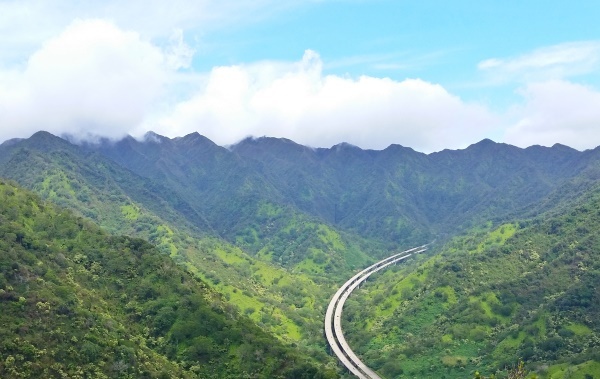 The North Shore is a region of Oahu that is a bit of a ways from Waikiki, but it also gives you a Hawaii experience that is far different from Waikiki. By car, it takes about an hour to get to the North Shore from Waikiki. Taking the bus to the North Shore, it can be a journey of 2 hours to 2.5 hours. This list goes from north to south along the North Shore. Also see the North Shore map! Best explored on a desktop! But if you’ve arrived on this page through Pinterest on your phone, first open up this page in your web browser, and then click on the map! So, what are some things to do on the North Shore of Oahu? If you’re looking for a hike on the North Shore, have a look to this pillbox hike on the North Shore! This is an easy one to add to your North Shore itinerary because it’s located right off the main road. It will likely take you 1 – 1.5 hours which can also be a perfect length of time. It won’t take up too much of your day, and you can still feel like you worked for those sweeping views of the North Shore from above! From here you’ll see Sunset Beach and beyond. 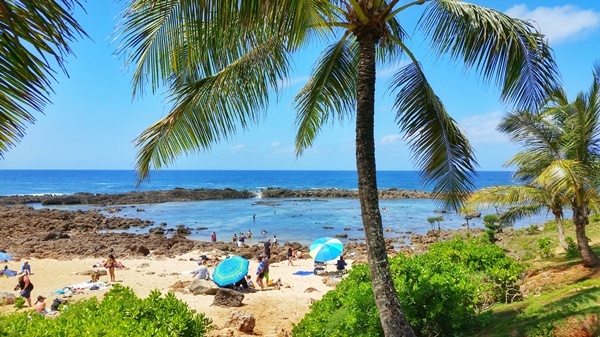 Shark’s Cove makes for one of the best spots to snorkel on the North Shore. Because it’s an enclosed lagoon, much of ocean waves can get shielded by the rock wall. This doesn’t mean it’s always a prime snorkeling time, in particular in the winter. But compared to much of the North Shore, it makes for a good beach to go snorkeling. This is a less visited site on the North Shore. It represents a piece of Hawaiian culture as a state historic site on Oahu. 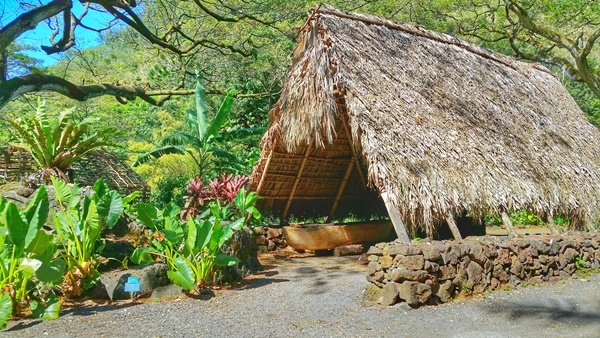 A heiau is an ancient Hawaiian temple, so it’s a way to get a glimpse of Hawaiian culture. And if that’s not enough to get you to go here, this is another place you can go to for amazing views of the North Shore from above! 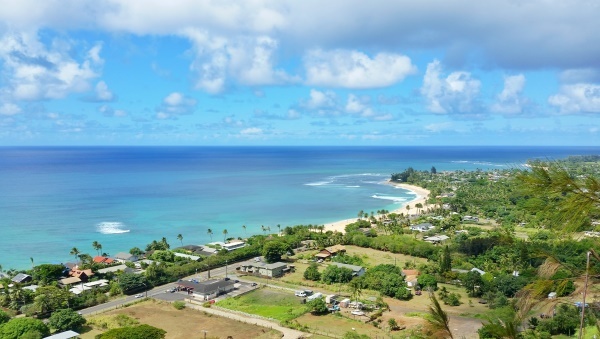 From here, you will be treated to views of Waimea Bay and beyond. You can find the road that leads to this vista right near Shark’s Cove. 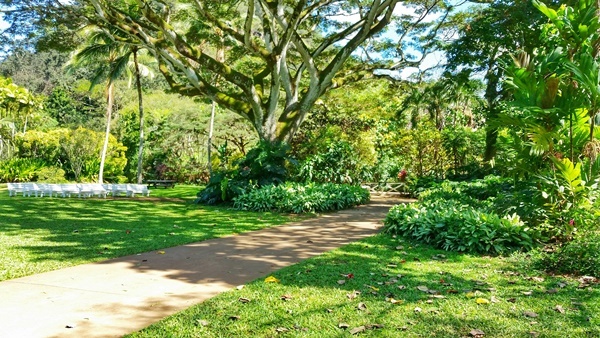 If you love exploring flowers and plant life, there’s a good chance you will love Waimea Valley. This park has over 40 themed gardens and over 5,000 different types of plants. There is an admission fee for this park. During the summer, there’s also a Hawaiian music summer concert series held here. 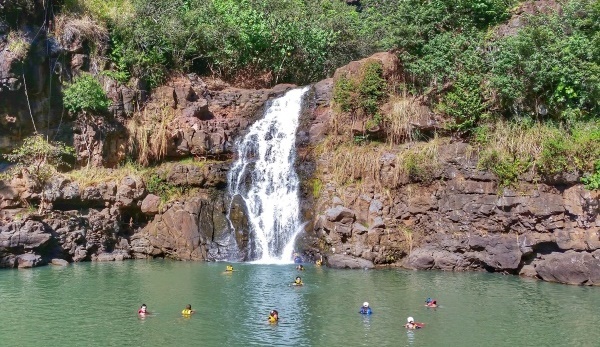 Waimea Valley is more than just a botanical garden. This Hawaiian ancient living site is also a part Waimea Valley. When you’re in Hawaii, try to make it a point to visit at least one Hawaiian culture site. 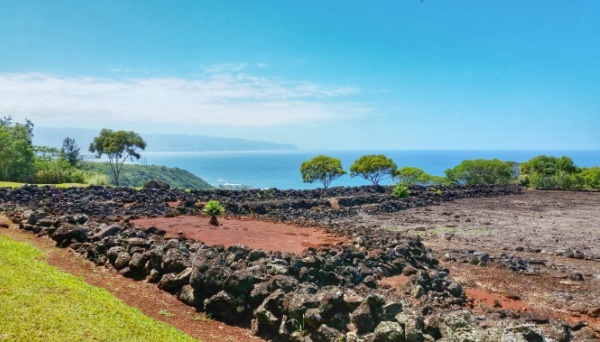 At this ancient living site, you can get a glimpse into the way native Hawaiians lived long ago. This is the last thing on this list that’s a part of Waimea Valley. There is a paved hiking trail that takes you past the different botanical gardens. It is this trail that will lead you to the waterfalls of the North Shore called Waimea Falls, which is one of the popular waterfalls on Oahu. You can usually go swimming at the waterfalls here, but life jackets are required. Those are provided. Waimea Bay is just across the street from Waimea Valley. During the winter months is when the North Shore can come alive. It’s known as a surfing destination, and Waimea Bay is one of the most popular beaches for that. 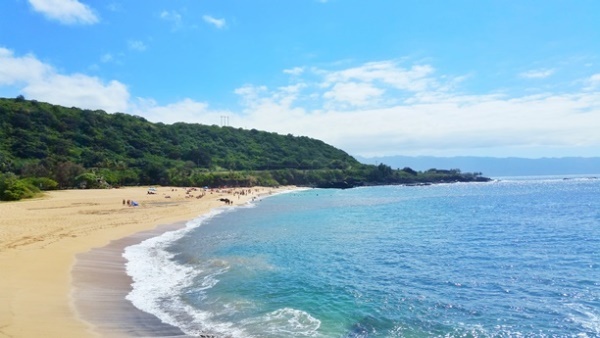 During the summer, Waimea Bay can be a good spot for snorkeling if the waves are calm. 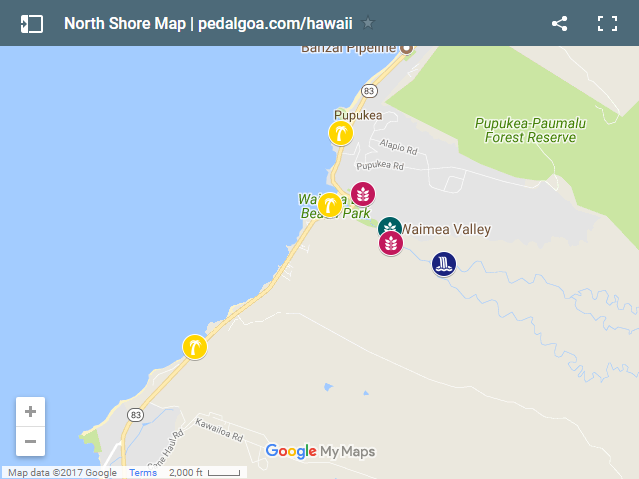 Parking can get a little tight at Waimea Bay Beach Park, which is why you’ll find some people park across the street in the Waimea Valley parking lot. It’s about a 10 minute walk to do so. 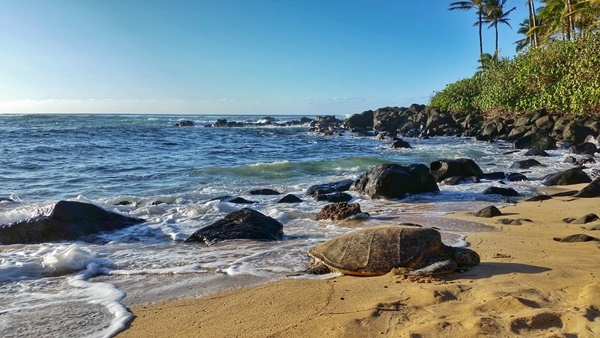 Laniakea Beach, aka Turtle Beach, is one of the most popular beaches on the North Shore because of the frequent turtle sightings. It’s known as one of the best places on Oahu to see turtles. The turtles may come ashore at any time during the day, but around sunset may be your best chance if you are looking for a time of day to go visit. Once you’ve passed Laniakea Beach coming from the north, you will soon be going through the main town on the North Shore of Haleiwa. And then from there, you will soon be going through Central Oahu. So next, find some things to do in Central Oahu!